↑ "गुरिल्ला वार क्षमताओं को बढ़ाता नार्थ कोरिया :यू.एस". FOX News Network, LLC. Associated Press. 23 June 2009. अभिगमन तिथि 4 July 2009. ↑ "Preamble". 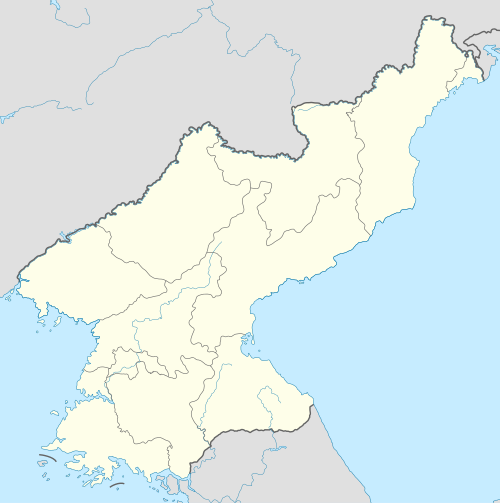 Socialist Constitution of the Democratic People's Republic of Korea. Pyongyang: Foreign Languages Publishing House. 2014. पृ॰ 1. आई॰ऍस॰बी॰ऍन॰ 978-9946-0-1099-1. मूल (PDF) से 8 June 2016 को पुरालेखित Amended and supplemented on 1 April, Juche 102 (2013), at the Seventh Session of the Twelfth Supreme People's Assembly. ↑ "Issues North Korea". Amnesty International UK. अभिगमन तिथि 1 November 2014. ↑ "World Report 2014: North Korea". Human Rights Watch. अभिगमन तिथि 1 November 2014. ↑ "The Parliamentary System of the Democratic People's Republic of Korea" (PDF). Constitutional and Parliamentary Information. Association of Secretaries General of Parliaments (ASGP) of the Inter-Parliamentary Union. पृ॰ 5. मूल (PDF) से 3 March 2012 को पुरालेखित. अभिगमन तिथि 1 October 2010. ↑ "UN: North Korea's policies cause the nation's food shortages". Pajamas Media. 23 October 2009. अभिगमन तिथि 22 October 2011. ↑ Bureau of East Asian and Pacific Affairs (April 2007). "पृष्ठभूमि नोट: उत्तर कोरिया". United States Department of State. अभिगमन तिथि 1 August 2007. ↑ "सशस्त्र बलों: पूरी तरह से सशस्त्र सेना". The Economist. 19 July 2011. अभिगमन तिथि 28 July 2011. ↑ Anthony H. Cordesman (21 July 2011). कोरियाई सैन्य बैलेंस (PDF). Center for Strategic & International Studies. पृ॰ 156. आई॰ऍस॰बी॰ऍन॰ 978-0-89206-632-2. अभिगमन तिथि 28 July 2011. The DPRK has implosion fission weapons. ↑ Oberdorfer, Don; Carlin, Robert (2014). The Two Koreas: A Contemporary History. Basic Books. पृ॰ 5. आई॰ऍस॰बी॰ऍन॰ 9780465031238. ↑ Seth, Michael J. (2010). A History of Korea: From Antiquity to the Present. Rowman & Littlefield Publishers. पृ॰ 306. आई॰ऍस॰बी॰ऍन॰ 9780742567177. अभिगमन तिथि 16 November 2015. ↑ Lankov, Andrei (25 January 2012). "Terenti Shtykov: the other ruler of nascent N. Korea". The Korea Times. अभिगमन तिथि 14 April 2015. ↑ Timothy Dowling (2011). "Terentii Shtykov". History and the Headlines. ABC-CLIO. अभिगमन तिथि 26 April 2015. ↑ Lankov, Andrei. ""North Korea in 1945–48: The Soviet Occupation and the Birth of the State,"". From Stalin to Kim Il Sung—The Formation of North Korea, 1945–1960. पपृ॰ 2–3. ↑ Lankov, Andrei (10 April 2013). The Real North Korea: Life and Politics in the Failed Stalinist Utopia. Oxford University Press. पृ॰ 7.